The end of an ideology. IT IS CHEERING to reflect that, when Bashar Al Assad’s government finally collapses in Syria, the governing ideology known as Baathism will likewise undergo a massive setback—though whether Baathism will fade away without a trace is something we can doubt. Baathism is one of the last of the grandiose revolutionary ideologies of the mid-twentieth century—an ideology like communism and fascism in Europe (both of which exercised a large influence on Baathist thinking), except in an Arab version suitable for the age of decolonization. Its champions came to power not only in Syria but in Iraq, in both cases in the 1960s; and the consequences were not of the sort that leave people unchanged. In Iraq, the Baath ruled for 35 years, chiefly under the leadership of Saddam Hussein, and this meant repeated military campaigns and acts of extermination against Iraq’s Kurdish population (Baathism is anti-Kurd), against Iran (Baathism, in its Iraqi version, is anti-Persian), against Kuwait, and against Iraq’s Shiite population, not to mention the protracted two-act war with the United States and its allies—from all of which the poor and suffering Iraqis will need a hundred years to recover. In Syria, the Baath has ruled for half a century, usually more shrewdly than Saddam. And yet, in Syria, too, permanent crisis has been the norm—the unending emergencies that derive from the Syrian Baath’s repeated wars against Israel and from the proxy wars using guerrilla armies and terrorists in Palestine and Jordan, together with the Baath’s intervention in Lebanon. And there is the history of Baathist mass executions and civilian massacres within Syria itself. Even so, Baathism enjoyed for long decades a prestige almost everywhere across the region, with branch organizations in various countries. Baathism appeared to be, in the eyes of its admirers, the ultimate in revolutionary principle—the truest hope for a “resurrection” or “Baath” of the Arab people from the Euphrates to the Atlantic, regardless of the really-existing Baathist regimes. And all of this is going to mean that, soon enough, when the Syrian Baath finally tumbles from power, the Baath’s legacy will be triply visible. The political and cultural landscape of the Middle East, post-Baath, will be pockmarked by blighted zones that might otherwise have been a prosperous Iraq and Syria, if only the Baathist doctrine had not destroyed those countries. A cloud of intellectual bafflement and paranoia will hover overhead, consisting of the confused thoughts of everyone across the region who, in the past, talked themselves into supposing that Baathism was a good idea. And more than visible will be the triumphant zeal of Baathism’s principal rivals in the matter of grandiose revolutionary ideology—the champions of the single Middle Eastern millenarian doctrine still standing, once the Assad regime has finally gone. These will be the Islamists. BAATHISM IS A PRODUCT of the European 1930s. The doctrine’s founders were Syrian students who attended the Sorbonne in the ’20s and ’30s, took their readings seriously, and came away with two impulses. The students wanted to overthrow French and British colonialism in the Middle East. And they wanted to conduct the overthrow in a modern spirit of revolutionary reform. Only they never could decide which version of revolutionary reform might suit them best, and they spent the next few decades veering from one to another, such that oscillation became Baathism’s identifying trait. The chief theoretician was a philosopher from Damascus named Michel Aflaq, who, during his Sorbonne years, sympathized with communism, mostly because communism appeared to be Western imperialism’s antithesis. In 1936, after his return to Damascus, it dawned on Aflaq, however, that Syria’s Communist Party was subservient to France’s Communist Party, which meant the Soviet Union, whose interests were not those of the Arab world. Also he read André Gide on the Soviet reality. He never did abandon entirely his left-wing instincts, which helps to explain why, in later years, he and his followers, having merged their organization with a left-wing party, ended up calling themselves the Arab Baath Socialist Party. But meanwhile he found new and more fecund inspirations in an alternative set of equally up-to-date ideas, which were those of German nationalism. German nationalism in the ’30s mooned over an imaginary long-ago when Teutonic Aryans roamed the ancient pan-Germanic forests. The German nationalists dreamed of reuniting the scattered Germanic tribes, and dreamed of reviving, through purification of the blood, the heroic Teutonic virtues. They inebriated themselves with mystic hoodoo about their own spiritual loftiness. They knew how to loathe. And all of these impulses proved to be transplantable to the Arab East. The post-communist Aflaq took to mooning over the Arab seventh century. He imagined a return to yore through a revived appreciation of blood ties. He attached to those ideas the modern-sounding concept of socialism, thus arriving at a national-socialism. He identified the spiritual loftiness of the Arabs. He located ethnic enemies, some of whom, by odd coincidence, turned out to be the very enemies that German nationalism likewise loathed. And he began to picture the pan-Arab resurrection. HIS BAATH EMERGED in Syria in 1941, in response to a coup d’état in Iraq. The coup overthrew a pro-British government and installed in power the Iraqi nationalist Rashid Ali Al Gaylani, who right away aligned his new government with Germany and the wartime Axis. The British sent troops. Rashid Ali fled to Berlin, where he spent the war broadcasting Nazi propaganda in Arabic. In Syria, though, Aflaq and his comrades meanwhile put together a solidarity committee for the coup. By 1943, the committee thickened into something of a political party (though the official founding convention took place only later). And Aflaq delivered a lecture at the University of Damascus called “In Memory of the Arab Prophet,” laying out his thoughts. Today we stand witness to a conflict between our glorious past and shameful present. The Arab personality was in our past unified in one body: there was no divide between its soul and its intellect, no divide between its rhetoric and its practice, its private and its public codes of conduct ... In contrast, in our present time, we witness only a fragmented personality, a partial, impoverished life ... It is time we removed this contradiction and return to the Arab personality in its unity, and make whole Arab life once again. So before they could conquer new lands and reach as far as they did, they had to begin with and conquer themselves, and to know who they were searching for in their souls. Before they ruled over other people, they had to rule over themselves, and learn how to control their temptations and to take charge of their will. In the past, one person’s life summarized the life of a nation. Today the life of the whole nation in its new revival should become a detailed exposition of the life of its great man. Muhammad was all the Arabs. Let all the Arabs be Muhammad today. He worked up these ideas during the same period when the Muslim Brotherhood in Egypt was putting together its own doctrines, and I am struck by the overlap, Baathist and Islamist. I wonder if Sayyid Qutb, the greatest of the Muslim Brotherhood’s ideologues, ever had occasion to study the writings of Aflaq. Occasional phrases of Aflaq’s do seem to turn up in Qutb’s essays and commentaries from the ’50s and ’60s, somehow or another. The notion of returning to the ancient Islamic past in order to construct a postcolonial future, the emphasis on psychological and cultural problems deriving from the penetration of Western ideas, the occasional fascist overtones, and the special role granted to the Arab people (a feature not just of Baathism but of the Muslim Brotherhood’s version of Islamism), together with the veneration of Islam and its prophet—this is a lot to share. Then again, in Aflaq’s Baath, the party leaders thought of themselves as the ultimate authority, instead of invoking the authority of the sacred texts and religious interpretations. The irksome little details of theology, sharia, and ritual interested Aflaq not at all. His Baathism was about Islam, or maybe it was an addendum to Islam, but it never claimed to be Islam itself. And Aflaq, with his talk of socialism, reserved the option of veering flexibly in different directions entirely—all of which has meant that, on doctrinal grounds, Baathists and Islamists could look upon one another as either friends or enemies, depending on whether they chose to emphasize the overlap or the lack of overlap. And, to be sure, the history of the Arab East over the last half century has offered examples of Baathist-Islamist alliance and enmity in roughly equal measures: In the case of Syria, the Baath’s violent enmity for its archenemy, the Syrian Muslim Brotherhood, contrasted with the Baath’s longstanding alliances with any number of Islamist groups: Hamas, Islamic Jihad, the Muslim Brotherhood of Jordan, Hezbollah, and the Islamic Republic of Iran. In the case of Iraq, the Baath’s insistence on war against the Islamist mullahs of Iran, contrasted with the Baath’s persistent habit of supporting Islamist terrorist groups elsewhere in the world, not to mention the Iraqi Baath’s post-defeat guerrilla alliance (if I may touch on a controversial matter) with Al Qaeda in Mesopotamia—enmities and alliances that follow naturally from the doctrine. THE BRANCHES OF Aflaq’s party tended to be conspiracies of the elite, consisting of schoolteacher intellectuals like Aflaq himself, together with military officers and tough-guy bruisers, who maneuvered clandestinely in the hope of staging their own coups d’état. This was the kind of movement that used to be known in the classic European left as “Blanquist”—secretive, crafty, steely, and revolutionary, indifferent to questions of mere popularity. (You haven’t heard of Auguste Blanqui? He wouldn’t mind.) And the Blanquist approach led to ideological consequences. The original Baath party in Syria conformed to the inclusive pan-Arabist ideal, with room in the ranks for Sunni Arabs, for Christians like Aflaq himself, for members of the heretical Alawi sect of Shiism, for Druzes and Ismailis, and for anyone at all who claimed some kind of Arab background, if only linguistically (though, to be sure, Aflaq ultimately reserved to himself the right to determine who is an Arab, with the crucial factor being in agreement with Aflaq’s ideas). But the demands of hugger-mugger inevitably tilted the Baath toward pickier ways of selecting comrades. Anyone joining a Baathist cell would naturally want to trust the other conspirators, and the simplest way to keep everyone reassured was to enroll people from similar backgrounds—comrades from the same denomination within Islam, or the same town, or neighborhood, or family. And when Baathists came to power, the conspiratorial habits led naturally to the triumph of the party’s military cells over its civilian cells. Aflaq’s Baath staged its coup in Syria in 1963, only to discover that, after a while, the Baath Secret Military Committee was running out of patience for the Baath’s civilian leaders. Aflaq himself, a mere schoolteacher, fled into exile. And who was the Secret Military Committee? The leading personalities turned out to be not just members of Syria’s Alawi minority, but people from a single village, belonging to a section of a single tribe and, in the inner circle, to the family of Colonel Hafez Al Assad, the father of Bashar. The Iraqi Baath, which welcomed Aflaq after his exile from Damascus, went through similar evolutions. The original leaders in Iraq belonged to the majority confession, which is Shiite. The leaders went down to defeat. The party revived sufficiently to stage a coup in 1963, and the new leaders turned out to be ruffians from a single neighborhood in Baghdad. Their coup was overthrown. The Iraqi Baath staged another coup in 1968, this time with sufficient strength to remain in power, and the principal leaders, this time, turned out to be members of a single tribe from the town of Tikrit, and especially from a single family, whose most prominent son turned out to be Saddam, a member of the Sunni minority—and Aflaq’s protegé, by the way. In this fashion, the Baath in Syria and Iraq alike ended up preaching an expansive pan-Arabism while practicing a narrow politics dominated by ever tinier kinship groups: anthropology’s triumph over ideology. You want family values? Baathism is for you. And, under these circumstances, nothing prevented the official doctrine from oscillating ever more wildly. The leftward turn accounted for Baathism’s inspirational appeal to Third World revolutionaries in Africa and Latin America—an element of Baathism’s success that hardly anyone can remember anymore. Baathism appeared to show that revolutionary political movements could adopt everything that was deemed to be attractive in communism (“scientific socialism,” the one-party Leninist dictatorship, the cult of the leader, the five-year plans, the expropriation of feudal estates, and so forth), without having to abandon a sentimental nostalgia for the local culture and a pious veneration of the local religion. And the left-wing and religious oscillations allowed for no end of political maneuverability. Saddam—to cite the Iraqi example—began as a religious believer. And yet, if you read his speeches from the 1970s, you could almost imagine that a communist is hectoring you from the podium. Here was a left-wing oscillation that appears to have been more enthusiastic even than Aflaq’s. And then, a few years later, Comrade Saddam oscillated back into the renewed emphasis on Islam that you can see in his final literary composition—his novel Demons, Be Gone! (or, in my Google translation from the Arabic, Get Out of My Damned), from early in 2003, pre-invasion—a Koranic action-hero melodrama, climaxing in a barely disguised burst of Baathist applause for Al Qaeda’s destruction of the World Trade Center. The Assads, father and son, have displayed the Syrian version. Hafez, the father, rose within the party at a time when, among the Syrian Baathists, Marxism was enjoying its maximum prestige. Once in power, though, he took to courting the traditional-minded clerics and Islamic scholars, as no Marxist would have done. And Bashar, the son, has gone further yet in trying to shore up his Muslim bona fides, not that he has enjoyed much success. But no one can say that Bashar has betrayed the Baathist principles. In matters of religion, Baathism is strictly AC/DC, and it can go either way. THE WHOLE DOCTRINE can be summed up in Aflaq’s slogan, which you will find stamped on party documents. The slogan is “Unity, Freedom, Socialism.” The slogan means anything you want it to mean. Or it means anti-Zionism, on the grounds that Arab unity, freedom, and social justice are incompatible with the continued existence of the country that Aflaq called, in quotation marks, “Israel.” Aflaq was also in favor of what he called “love,” which he regarded as the true meaning of Arab nationalism. 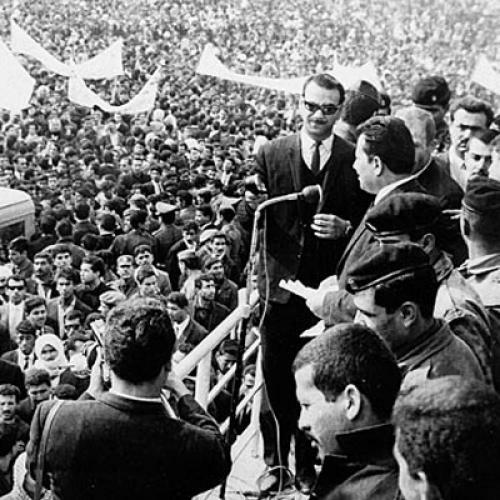 It is tempting to conclude that Baathism is a nonsense ideology, and the truest goal of Baathist leaders has never been anything loftier than power and their own pragmatic self-interest. But that seems to me inaccurate. “Unity, Freedom, Socialism” has, in fact, always expressed something, even if, like a football chant, the meaning bears no relation to the words. The slogan expresses an ideal of ferocity. And ferocity does not entail pragmatism. Given a choice between ferocity and their own best interest, the Baathist leaders have more than once chosen ferocity. In the weeks or months in 2003 when Saddam was composing Demons, Be Gone!, with the Coalition of the Willing getting ready to invade, he could certainly have elected to negotiate a gilded exile for himself and his family. He preferred otherwise. Bashar Al Assad’s instincts appear to be similar. Surely Kofi Annan’s ultimate goal in Syria was, like a real estate broker, to relocate the unhappy Assad family to a London townhouse, where the ex-dictator would have discovered, ten years from now, that Vogue was once again fascinated by his wife, and his own opinions on Middle Eastern affairs were keenly solicited. But, like Saddam, Bashar prefers to hunker down. Or he is like Muammar Qaddafi, another revolutionary with a nutty revolutionary doctrine—and not like, say, the non-Baathist and merely corrupt dictator of Tunisia, Zine El Abidine Ben Ali, who, at the start of the Arab Spring, proved that he was genuinely a pragmatist by cutting his losses and those of Tunisia and getting on a plane. Baathism is, in short, a cult of resistance. Resistance to what? And on whose behalf? Resistance to imperialism and Zionism, of course. Zionism especially. Resistance on behalf of the pan-Arab people and their “spirit.” Baathism’s leaders would rather die than abandon these words, even when the words are meaningless. Death it is, then. Surely this is Baathism’s most destructive trait of all. The cult of resistance leads to a culture of hysteria. Once you have spent 35 years or 50 years manning a machine gun and vowing resistance to the end, your ability to work up more thoughtful habits of mind is bound to become a little circumscribed. A capacity to weigh evidence, a feeling of curiosity about other people’s views, a spirit of tolerance, the traits that are necessary for a liberal alternative, in short—these traits are not likely to survive. We have seen the results in Iraq, and we will see them in Syria. Some of the Baathists themselves appear to have noticed these developments. The most important of Aflaq’s comrades in founding the movement was Salah Bitar, a fellow student at the Sorbonne back in the ’20s and ’30s. By 1977, Bitar was in a mood to take stock, and he spoke his mind to Hafez Al Assad in person. Bitar told Assad that Syria was dead. He said, “Today only democracy can give a new vitality to Syria.” But this was not a welcome message. Bitar was obliged to go into exile in Paris, where he was assassinated, and his dissent left no legacy at all. Orthodoxy belonged either to the Assads or to Saddam. Something in the Baathist doctrine is insane, and this is worth emphasizing. The Arab Baath Socialist Party has slaughtered more Arabs than any institution in modern history, though the French army in Algeria may be able to put up a rival claim. No one has definitively tallied up the deaths committed by the Baath in Syria, not in 1981, when Hafez Al Assad presided over executions by the hundreds, nor when he leveled entire neighborhoods in Hama back in 1982, nor in 2011 and 2012, when his son has gone about doing the same on what appears to be an even bigger scale. It is a matter of tens of thousands, though (and worse may be to come). The Iraqi Baath achieved a toll of many hundreds of thousands. The Baath in Iraq was the only government in the world, after the Nazis, to use poison gas on its own people. And here is Bashar’s Syrian Baath threatening to make use of its own stocks of poison gas, if only against foreign invaders—meaning, from a Baathist standpoint, against anyone at all who has taken up arms. Will someone argue that, in Syria and Iraq, the Baath never succeeded in establishing total control, therefore should not be considered a totalitarian movement? But totalitarians never achieve total control. They merely give it an honest try. What marks a totalitarian movement is the vigor and lunacy that animates the honest try. Ultimately a totalitarian movement is a political tendency that, in a spirit of nihilism, is committed to achieving the opposite of whatever it says it is going to achieve, and will stop at nothing to bring this about. Soviet communism in the age of Stalin was ruthlessly devoted to constructing a gigantic slave-labor system in the prison camps. Nazism left no stone unturned to bring about the ruination of Germany. Baathism is an anti-Arab movement. Hasn’t this been obvious? But this did not prevent the Baath from thriving, in its day. BAATHISM AROSE in competition with four other main Arab ideological currents in the post–World War II years, with all four currents preaching revolution in some version or another—not just Islamism, but also Gamal Nasser’s variant of pan-Arabism in Egypt (a current very similar to Baathism, without the extremist edginess), together with a couple of currents that were overtly secular or even anti-religious: single-country nationalism (Syrianism, for example) and communism. Today, three of those movements survive only in shards and fragments, which would be encouraging to learn, except that Islamism is in bloom. In the political psychology of the region, the era of decolonization has somehow not yet come to an end. The questions that Michel Aflaq worried about in 1943 are the questions that Islamist authors still worry about in our own moment, as if, in the mind of masses of people, nothing has changed. These are questions about alienation—about the conflict between the glorious past and the shameful present; about the divide between soul and intellect, and between private and public codes of behavior; about the need to control the temptations; about the need, finally, to repel Western civilization’s invasion of the Arab mind. But the Islamist answers are unlikely to be any better than Aflaq’s. We will know that a genuinely modernizing impulse has overtaken the region when altogether different questions begin to dominate the discussion, namely: how to become prosperous? And free?—along with a liberal willingness to evaluate the real-life results. Only, these questions imply a non-ideological habit of mind, and the world left behind by the Baath and its doctrines does not appear to be a world of the post-ideological. Paul Berman is a senior editor at The New Republic. This article appeared in the October 4, 2012 issue of the magazine.